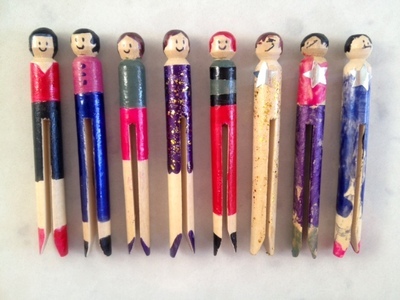 Budding fashion designers can go wild creating these fun peg people dolls out of wooden clothes pins and colourful nail varnish. Create your own outfits and hairstyles. 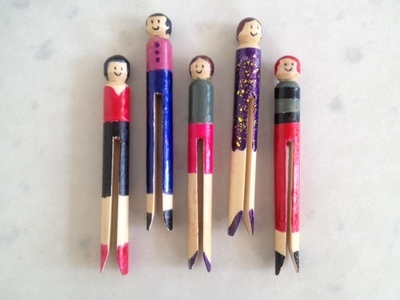 You can use the final creations as dollies, play with them in the garden (they will stand up well in a flowerbed), brighten up a flower pot for Mothers Day - or just use as a colourful clothes pegs! Pick up a selection of colourful nail varnish. You can usually find very low cost bottles at discount stores or on special offers at the pharmacy. You could also use regular paint. 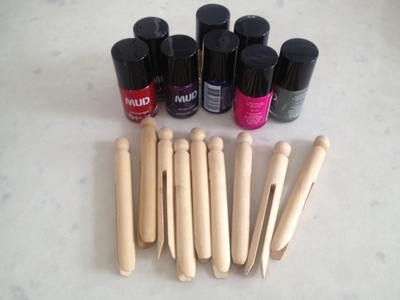 However the nail varnish works well as the colours are vibrant, there's no need for a separate layer of gloss and there is minimal tidying up as the brushes just screw back into the bottles. 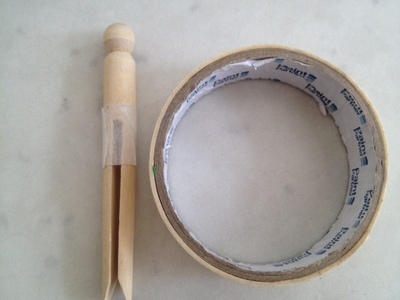 Use masking tape to mark off shorts or trouser lines. It then doesn't matter if you paint over the tape as when you peel it off you will have a nice straight line. 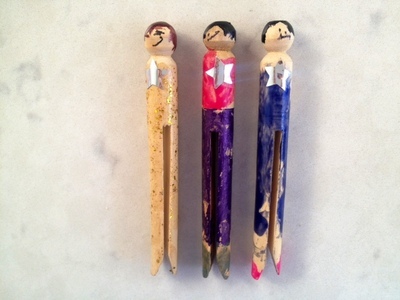 Paint outfits on the peg dolls using the nail varnish. 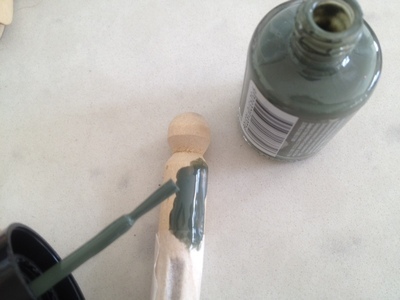 Pop the peg over the side of a thin walled container whilst it dries. Paint on hair with nail varnish. Help young children with the hair by holding a finger over the face section to avoid getting any coloured varnish by mistake on the face area. 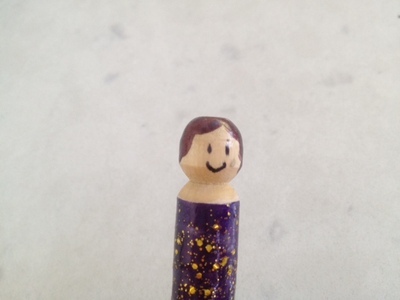 You could also stick on a circular sticker when painting the hair to keep the face area 'clean'. Draw a face using a fine tip pen. 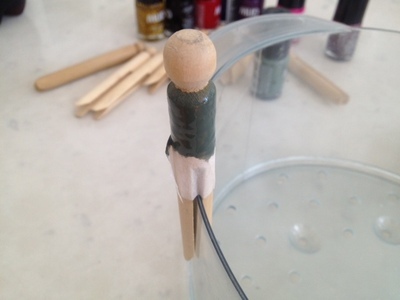 You can then vanish over the face using a clear nail varnish to seal it. Varnish over any other unpainted areas using a clear varnish. Add any other embellishments- e.g. star stickers etc. 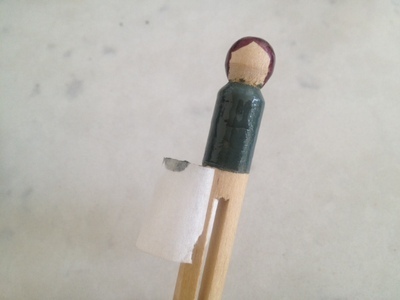 Your peg doll is now complete! Give each one a name and a character. Why not make a whole family or a gang of friends?